I haven't opened any product to taste it. It was received in a very timely manner, and nicely packaged. All my supplies are stored without sampling any of them. I'm trusting your company above all the rest for quality (and taste!) so in an emergency I have every packet of food available. Thanks! I have my fruit, veggie, and snack mix stored away for possible use later. I haven't had the need to try it and hope that I don't. Excited to have back up food and deserts. It all looks great! I will try some over the next few weeks for taste tests and freshness. I will report back. I received the order quickly after ordering. I have not tried any of the food so I can't evaluate it. I don't like chocolate so the chocolate pudding is a waste for me. I will have to find someone else to give it to. It would be helpful if it could have been replaced by some of the other fruits or vegetables in the package. When ordering, I was told that was not possible. I understand that the packages are made up as listed and cannot be changed. I have not tried any of it. I have been ordering a little each time and I am sure its worth more than I paid for it. I can't do an evaluation, because it went into my stash for when the SHTF. SORRY!!!!! Frank Bates and his entire staff are really good folks. They've shown me every courtesy with my many purchases. I can't speak to the taste of the kits because they're in my safety stockpile. I am not worried, I'm sure they are as good as the regular kits, which I have eaten. I will not "try" the survival food I have purchased until I need to use it to survive. I make a fairly low wage and do not have money to arbitrarily spend. I read the reviews before writing this and now feel compelled to taste the food, as only 1 person in the reviews head actually tasted it! Being able to buy food from you that I know I can rely on gives me peace of mind. I leave in Fl. where there is always a chance of natural disaster - hurricane - etc ....this helps me be prepared. Knowing if the SHTF, I will be able to survive for and extended period of time, bugging in till I can bug out helps me sleep at night. God Bless You. When planning in advance for any crisis, it's hard to decide how many varieties of food to stock. However, it was a no-brainer to add vegetables and fruit to the mix. Any kind of diet will need to be balanced - and once grocery shelves are emptied and produce is no longer on the shelves - it's important for our bodies that we make the right choices. I'm grateful to Food4Patriots - they've had the forethought to plan ahead and provide for all our needs. Thanks!!! I was totally impressed with the taste of the snacks! My Grandchild ate some and they liked it which says a lot if children will eat it! 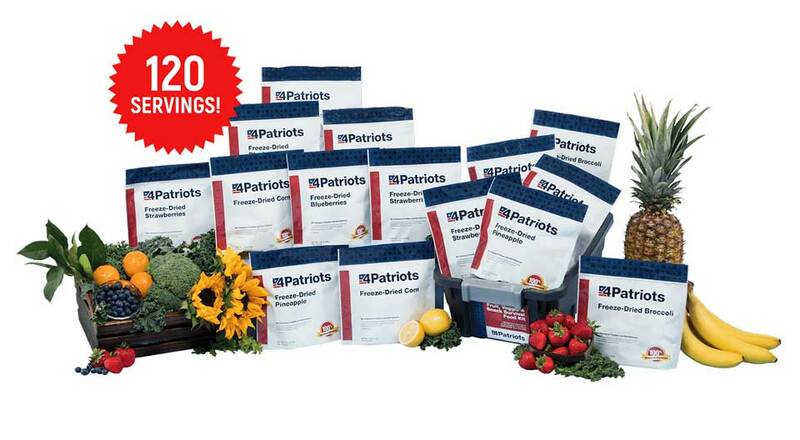 Thanks to Food4patriots for helping me be prepared! As with the entrée pack, this fulfills my requirement of a side dish. Excellent quality. Will order another !! An excellent product. A most important protection against future disruptions in our regular food supplies. Thanks to "Food 4 Patriots"
I rec'd my fruit and veggie kit and was pleased with the packaging and with the variety of fruits and veggies in it. I havent tried any yet but im sure theyll be great when the time comes to eat them. Im saving them for tough times and glad i could buy them before things got really bad with the civil unrest going on in this country. So Far I've been very pleased with anything that I have purchased from you and the Fruit & Veggie snacks are no exception. I've tried the strawberries and you can't tell them apart from the fresh ones when you put them in liquid (like cereal). I have only used one package of strawberries, which I put on my cereal for several mornings.They were very good, and I expect the rest to be fine.However, I do not intend to use the rest now. although I haven't tasted any of it yet it is with my survival stock pile I know that any meal will be well balanced with this addition. when the grocery shelves run out of produce I know that I will have a back up plan that will be an addition my growing garden. I would like to see more variety of vegetables like peas or edamame, apples. or potatoes. the chocolate pudding is a nice addition.. I really cannot honestly rate since we haven't tried it yet. We just bought the year supply and needed to supplement that with these packages. Therefore knowing how good the other was we are trusting this to meet our needs. You have done a great job in the main courses that we were convinced that the fruit, veggies and snacks would be just fine. My wife and I thank you for a great product. I have not sampled any of these fruit and vegetable dehydrated foods. I am buying these strictly as an emergency store of nutrition and expect never to have to use them. But, if the dreaded time comes, I believe the foods will be tasty and nutritious. I am not young and it's likely the packaged foods will outlive me. But I have 3 grandchildren who may need them in a time of crisis. The packages are well protected in heavy plastic totes and delivery was quick and free. I am sorry that I cannot review my purchase . . . I am saving it for the time when my family and I really need it.